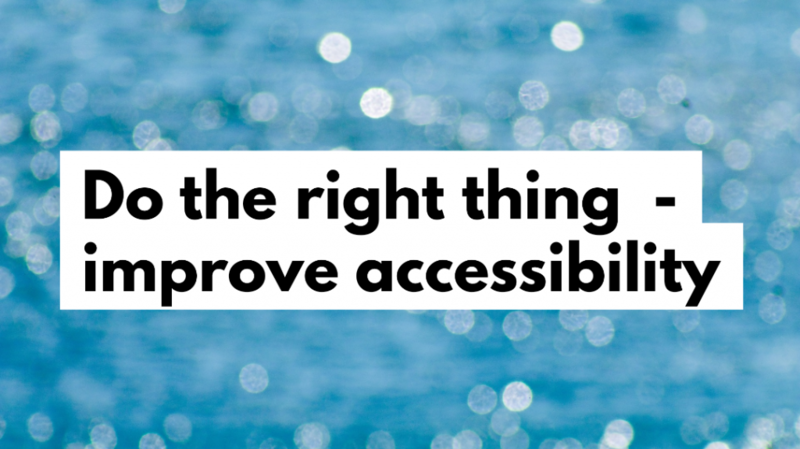 Accessibility improves the user experience for all users. It’s worth doing. It’s the right thing to do. If you don’t believe me, try and experience the lack of accessibility yourself! Read on to learn how. A web-site is accessible, if the site’s content is available to everyone, anyone can operate the site’s functions and anyone can literally access the site. Accessibility benefits persons who are experiencing some kind of impairment. The impairment may concern vision, hearing, motor or cognitive abilities. And the impairment may be situational, temporary or permanent in nature. If you think about it, we are all disabled somehow at least in some situations. Like when we’re in a hurry, distracted, stressed, under a big cognitive load, tired or in poor lighting. So accessibility benefits you. And me. And everybody! Why aren’t more sites accessible? Those who design, code and test the sites typically have good vision and hearing. They can operate keypad, mouse or touch screen. Their cognitive abilities are ok. People like them can probably use the site just fine. And it is easy to forget not everyone is the same. Having empathy has a huge role in making web sites accessible. That’s why it is good to experience the lack of accessibility yourself. To see how it feels. Following are three important accessibility guidelines. With them I give you tips on how to try them out. If you dare, try them with your own site! Make it easier for sighted but visually impaired users to see things clearly. To simulate different kinds of visual impairments, try NoCoffee-extension to Chrome. With this extension you can check how your site looks like e.g. with color blindness or with blocked visual field. Can you still see everything clearly enough? If not, try to fix it. Ensure the code tells each element’s role, name and value. This way users with assistive technology can understand the meaning of the elements. To experience how it feels to make sense of a site’s elements without seeing anything, try ChromeVox screen reader extension to Chrome. Once the extension is on, go your site and move around with tab-key and your eyes closed. Listen to the screen reader. Can you make sense of your site? If not, try to fix it. Use descriptive alternative text for images. Put your mouse away and try to move around your web-page with a tab key. Can you proceed in logical order? If not, try to fix it. PRO TIP: You can also go to your browser’s developer tools, where you can run an accessibility audit. This tool finds you the exact spots in your code where you can improve the accessibility. If you tried these tips you may have now felt the pain with lack of accessibility. I hope it’ll give you motivation to try and make your site more accessible. I know I still have work to do with mine. But I’m ready to do it!